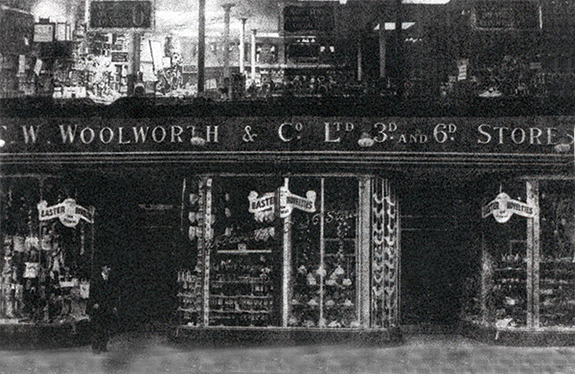 In July 1926, Woolworths bought the block of 2-6 Wellington Place and 15-20 Pelham. 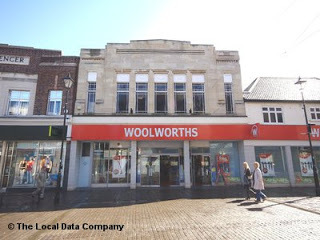 The buildings were demolished (according to the Hastings Chronicle) to build the Woolworths store which opened in 1927. 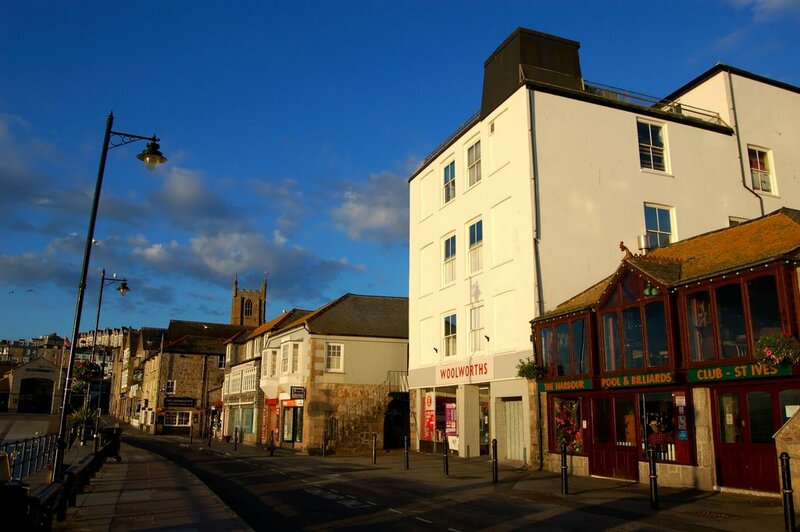 It was an interesting looking building, with four storeys including a roof level with four windows. There were two circular windows on the third floor. In the 1960s there was a makeover, with this rather retro blue tiled look. This is a side entrance view. I do like the look of the steps up to the door, very stylish. 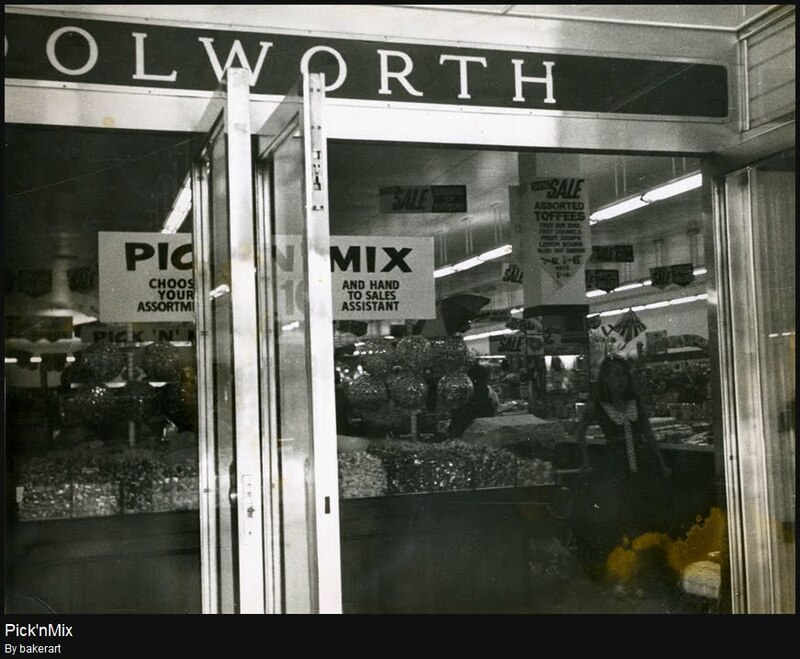 Former employee Mike Edwards started his Woolworths adventure, as he calls it, in 1963. This is a view of the main entrance. 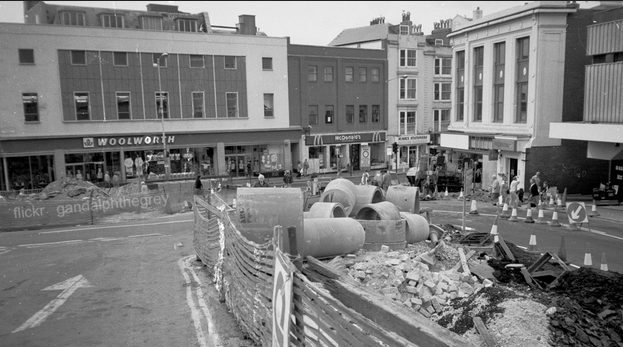 This photo was taken when the underground walkway was being built in 1988. 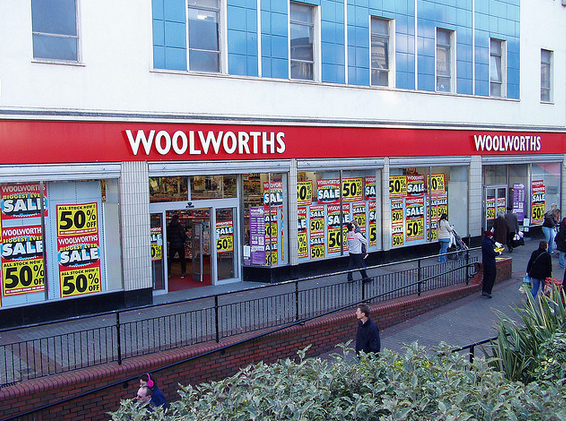 This is a 1990s photo where you can see the Woolworths fascia has been updated. 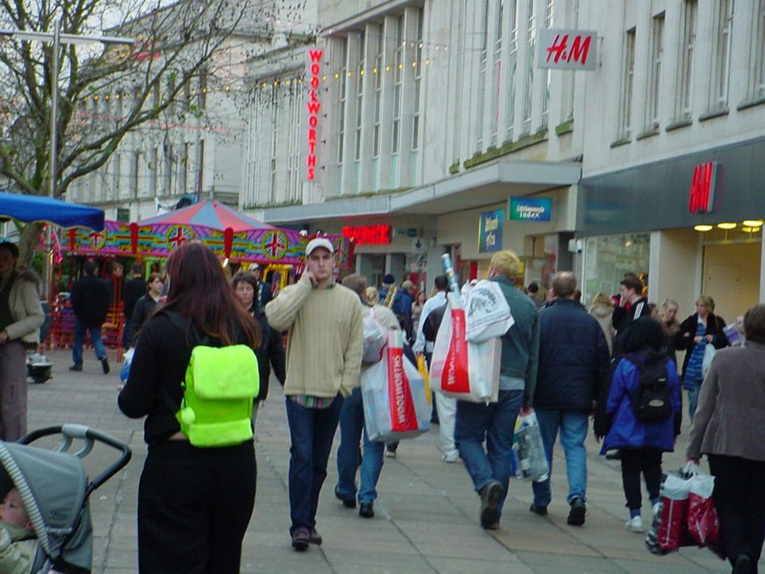 You may remember the offers seen in the window in 2004 – 3 for 2 mix & match all stationery & all schoolwear, half price boys, girls and babies coats, summer clearance and half price Quality Street. Also note the broken door patched up with MDF. 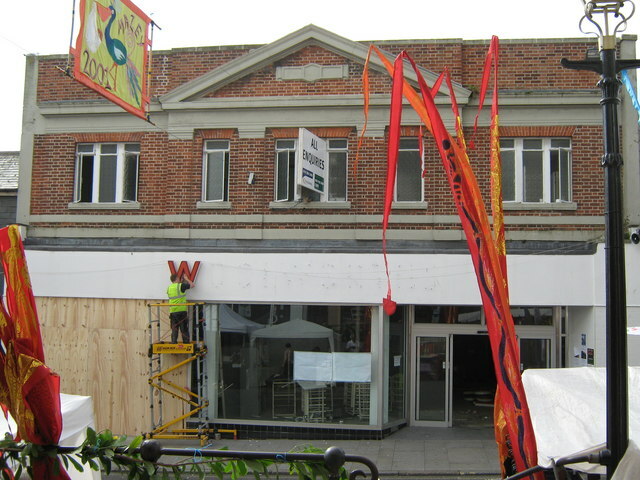 The fascia was updated one last time to red with white text, before closing for good on 2nd January 2009. 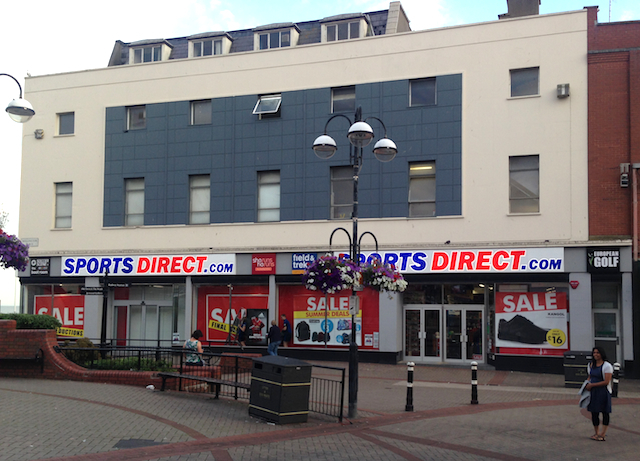 It soon became a Sports Direct – here’s a photo we took a few years ago whilst on holiday in Hastings. It’s a large, prominent store – you can’t miss it. They have painted the blue tiles grey, but apart from that is looks exactly as it did as a Woolworths. And even the 4 little roof windows are recognisable from the earlier 1950s photo – a real piece of history. 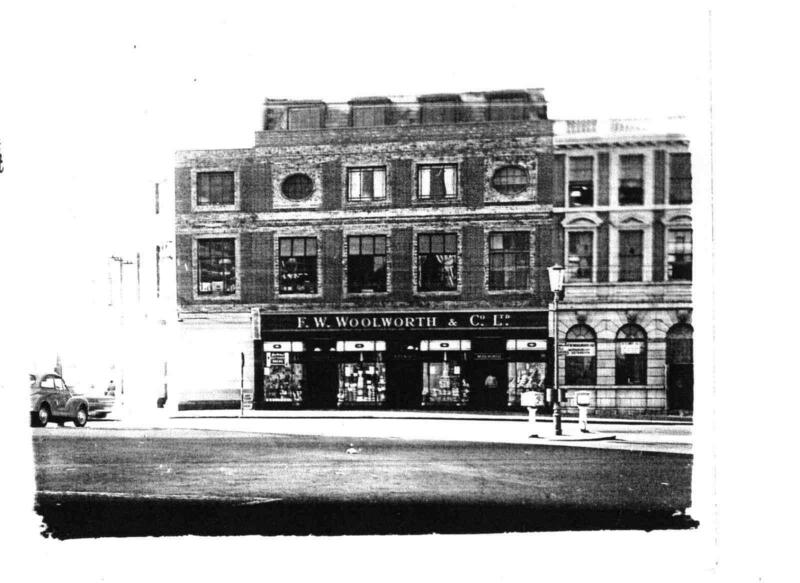 Woolworths opened on the bustling Holloway Road in the 1920s, opposite the Nags Head public house of which the area is now named after. 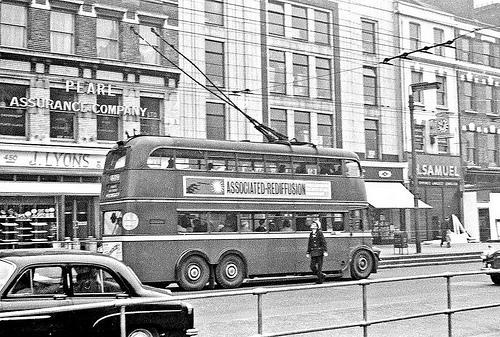 Here is a photo from the 1950s, when trolleybuses were in use – there was a bus stop directly outside the store. There were upper floors, so I would say this was quite a large Woolworths. 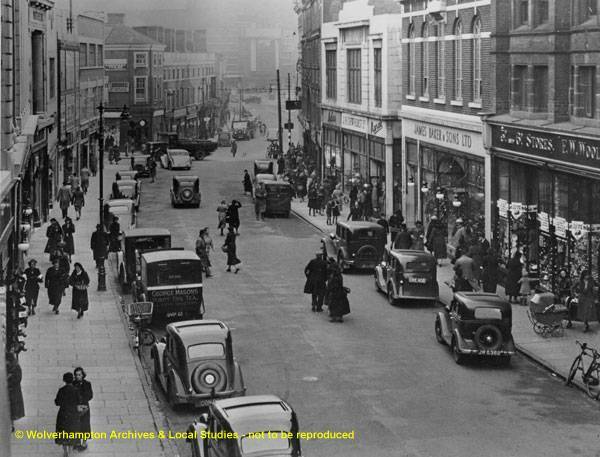 Below are two photos from the 1960s, where we can see the neighbouring buildings were J Lyons tea shop and H Samuel jewellers. It appears the road has also been enlarged since the 1950s. Somewhere along the line, there was a makeover, I am guessing in the 1950s/60s from the look of the building today. Then the store closed, possibly in the 1980s when Kingfisher took over, I can only speculate. What I do know is that it was definitely an Iceland in 1997. EDIT: This post was originally written in November 2014, and it was indeed the store that inspired the creation of this blog. 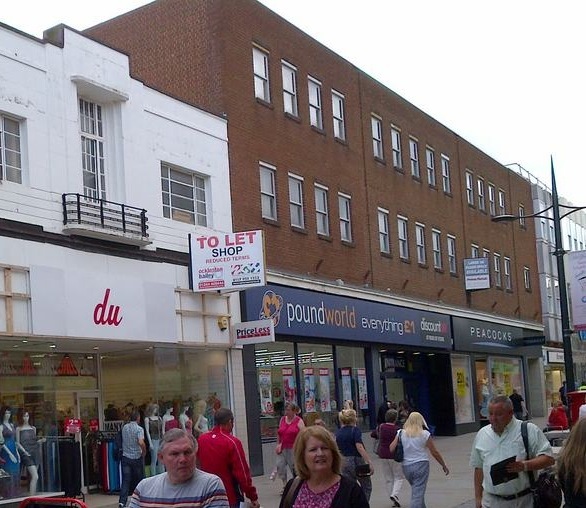 This store was the second Woolworths in Wolverhampton, opening on 23rd May 1925 (The first Woolworths was in Victoria Street, Store 13, which opened in June 1912). 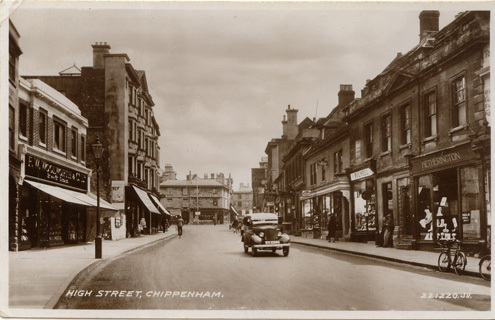 The store was extended in 1927 and then in 1930. See below on the far right, next to James Baker & Sons. 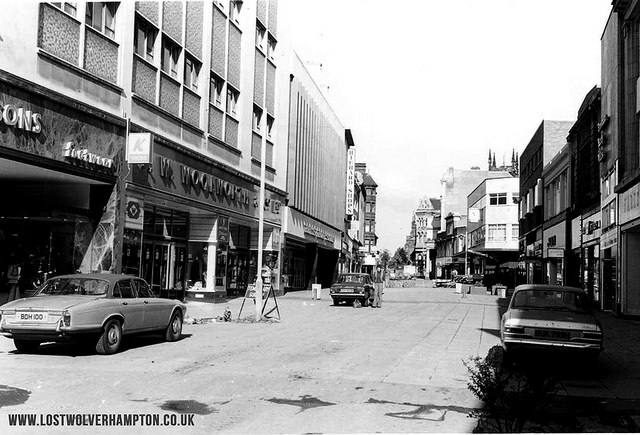 In the 1960s it was part of a major town centre redevelopment scheme, with the building of the Mander Shopping Centre. 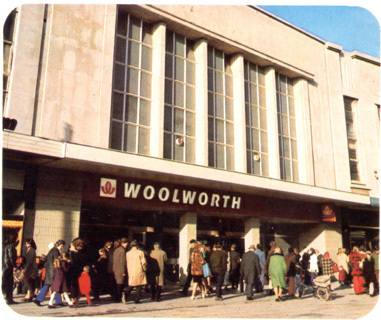 A huge Woolworths superstore opened in stages between 1965 and 1968. 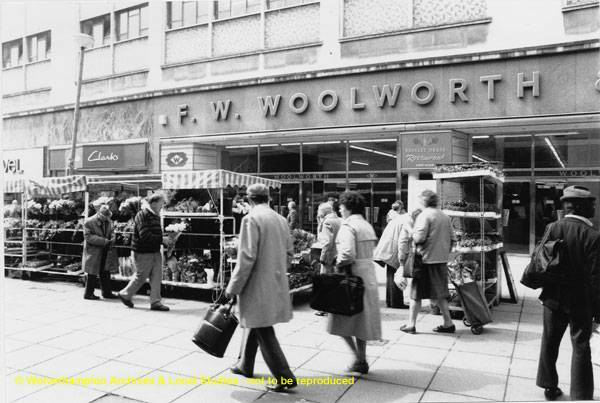 This was when Wolverhampton store was the biggest Woolworths in the country! It boasted three floors, with the entire basement dedicated to fresh food, including a fresh fish counter. 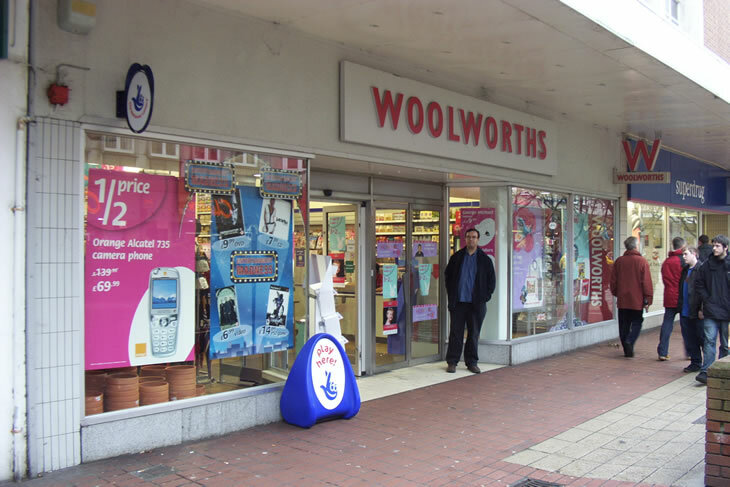 The ground floor had the more conventional Woolworths layout. 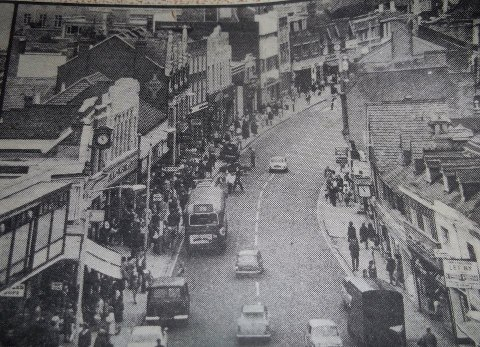 The top floor was dedicated to furniture and carpets and had a large Harvester Restaurant! There were also 3 stockroom floors, as confirmed by Paul Broome who was a management trainee here from 1983 to 1984. In 1985 Kingfisher experimented with an Electronic World store, but the withdrawal from food on 16th October 1986 left the store uneconomic. 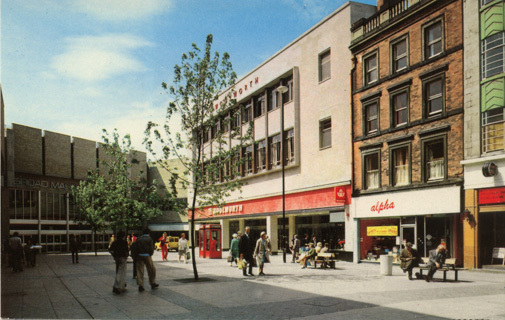 The store was cut down, with the restaurant closed and the upper two floors split off and re-let on 16th August 1988. Below is just before this happened. This floor became Boots. 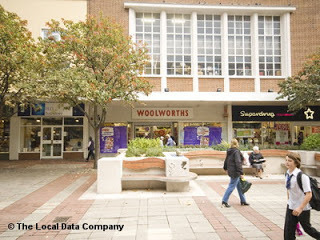 In 1989, Woolworths traded only from their basement floor, following a refurbishment, with their main entrance in the shopping centre and a door into Dudley Street atop a steep flight of steps. See below the small entrance next to the Boots which took over the unit. 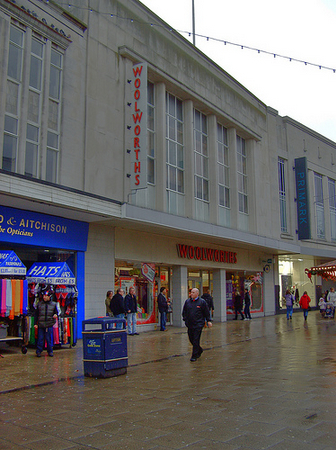 In the 2000s, Wolverhampton Woolworths was converted to one of the 10/10 stores. 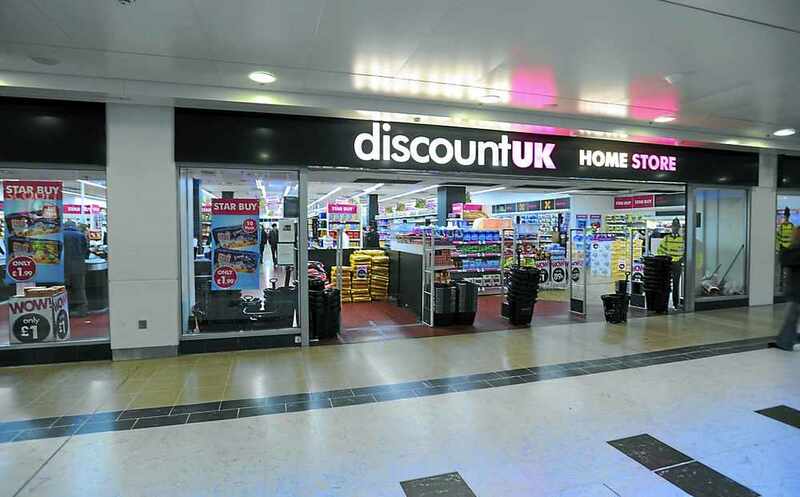 But the latest news for the Mander Centre, now that they have new owners, is that 10 discount stores are being ousted, including DiscountUK. 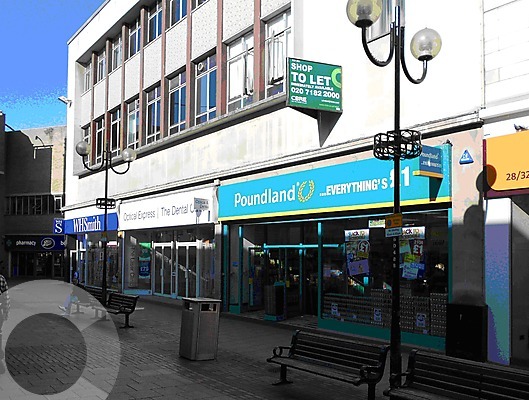 Then they are going to turn 39 units into 11 larger units, including one 3-floor Debenhams, as part of a £25 million revamp (see artist’s impression below) – all to make it a better shopping experience for everyone. 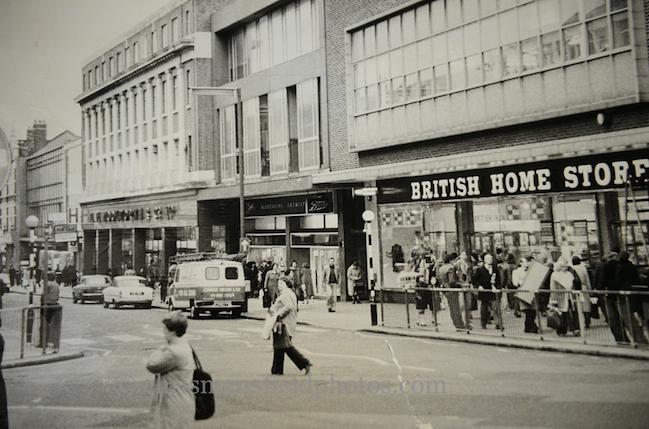 Wow a new 3-floor Debenhams, like there was a new 3-floor Woolworths in the 60s – history repeating itself! 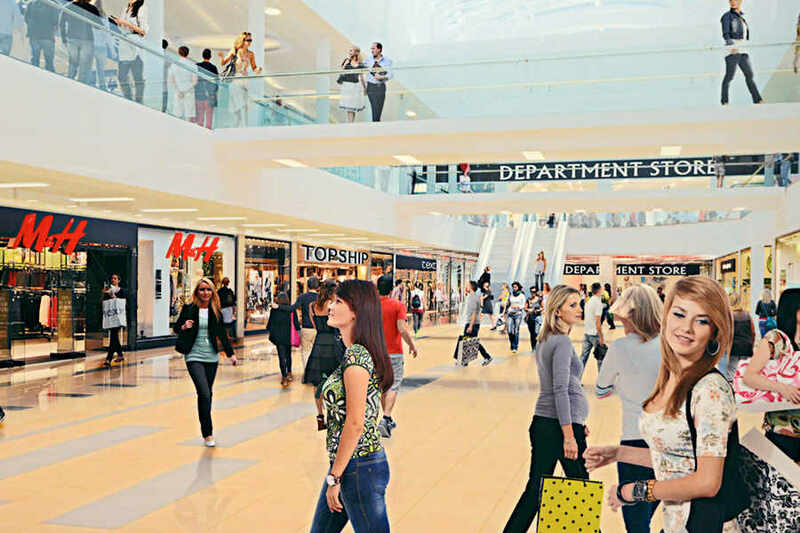 EDIT: I originally wrote this post in 2015, and since the, the Mander Centre redevelopment has finished and it is now open. 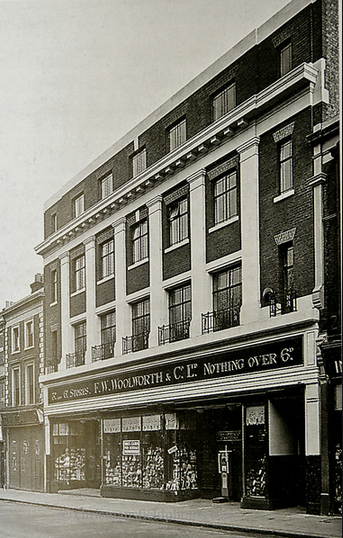 One of the very early stores, Woolworths opened in the North London town of Stoke Newington in 1915. 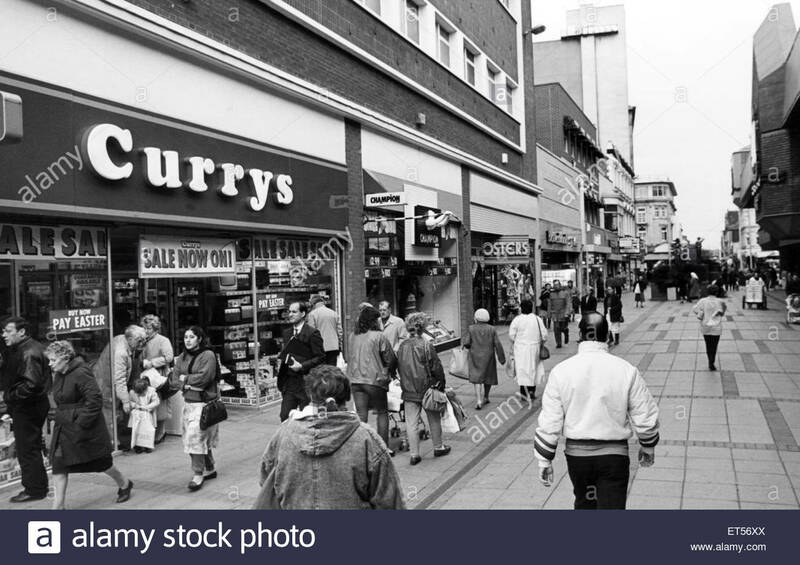 It was part of a parade of shops, not a specifically purpose-built store, and you can see it below through the decades looking relatively unchanged. Photo from my Facebook group. After Woolworths closed on 27th December 2008, Iceland bought the store in January 2009, where it is still trading today. 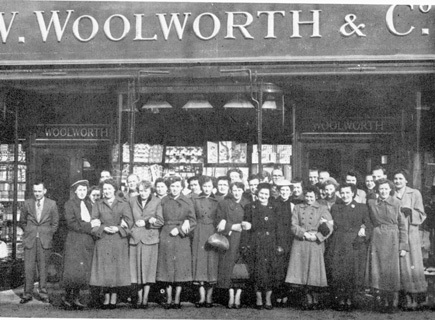 The 50th Woolworths store to open in the UK was in the seaside town of Southsea (after the neighbouring Portsmouth branch opened a year earlier), opening on 26th June 1915 at Palmerston Road. 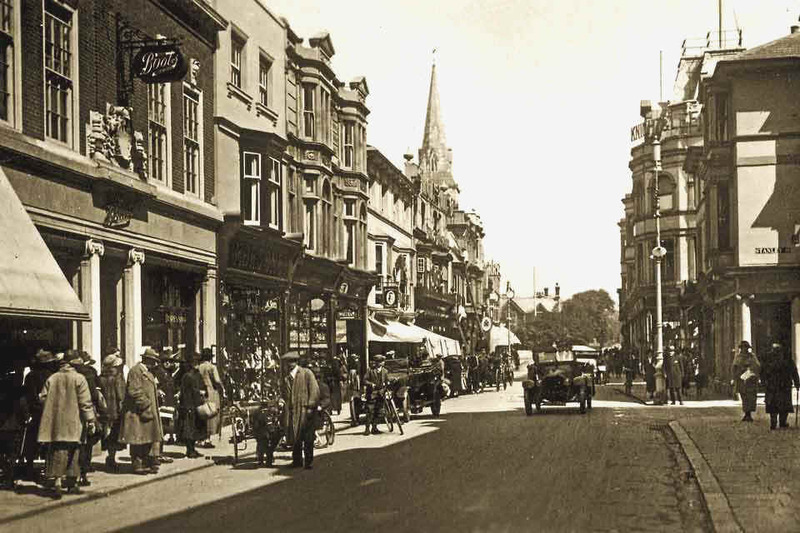 Below is the road in 1925, one of these shops was the Woolworths. 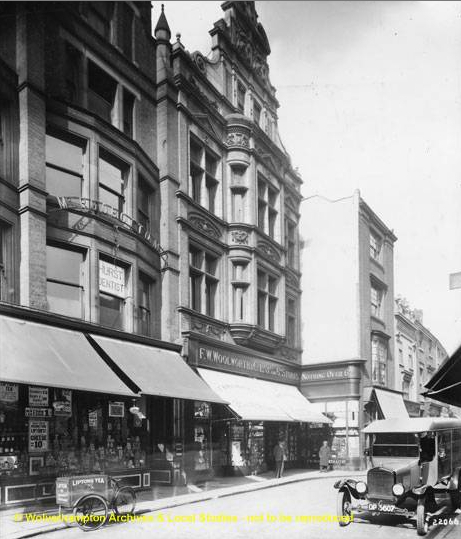 As sales were good, the building was extended in March 1932. Unfortunately this was one of the 26 stores that got destroyed in World War 2, on 11th January 1941. 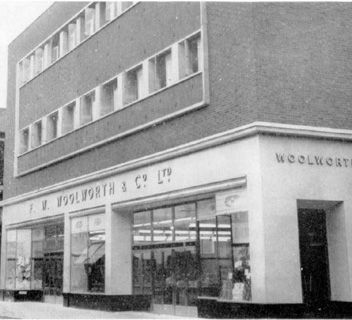 After the war, Palmerston Road was redesigned, and Woolworths moved to a new location at numbers 19-23, opening on 10th October 1951 with a newly designed store. The new building was more accessible, with wider step-free entrances, and was significantly larger and brighter. 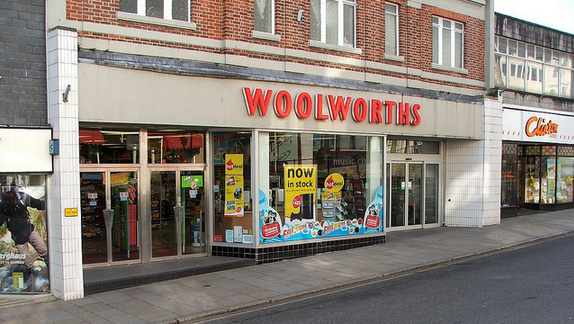 From this photo you can see they even put a ‘Woolworth’ fascia above each set of doors. 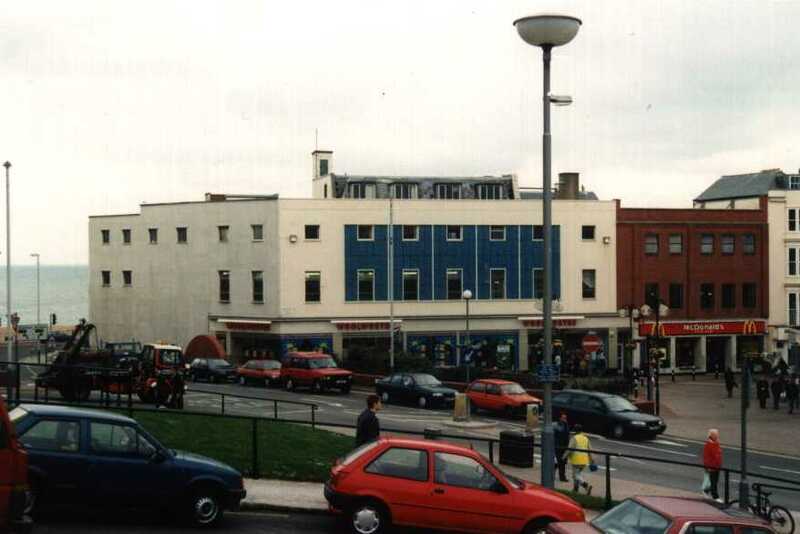 Southsea Woolworths was one of the last stores to convert to self-service in 1973, I presume it being a laid-back seaside town, they took their time 😉 In 1988 the building was split in half, with 22-23 given to Superdrug. 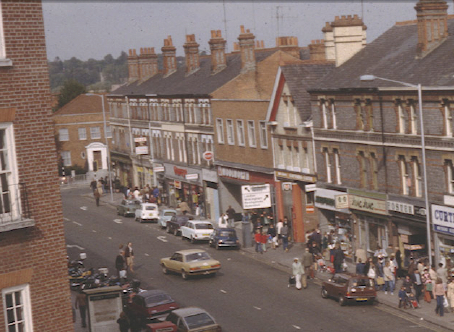 Then the store was was modernised again in August 1992. 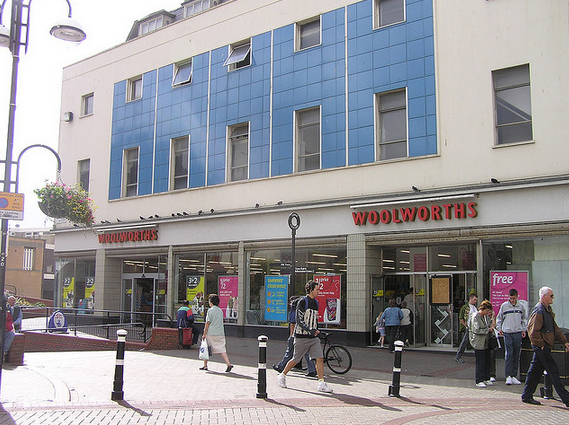 Southsea Woolworths closed on 2nd January 2009, looking pretty much as it did in 2004 in the photo above. It lay empty for over 2 years. What’s nice to see is that above the library and Superdrug, the building appears exactly as how it looked in 1951. If you ever visit Southsea, do have a look. 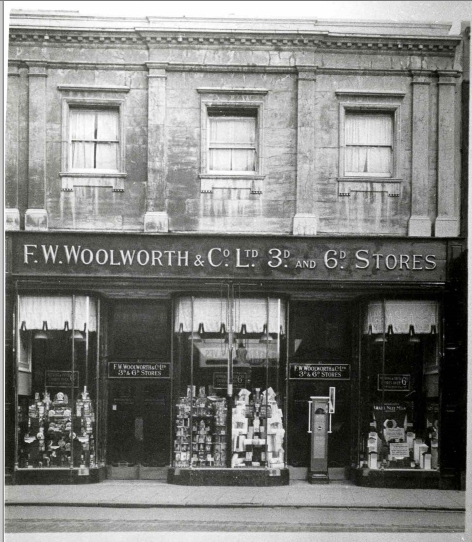 Woolworths opened in Swindon the 12th September 1914 on Regent Street where it traded in a small buildling which was then extended to the left (No, 23) in 1936. There was a refurb in 1973, which is when I presume they lost their beautiful Art Deco style facade. There was another refurb in 1980 and one more in 1995. 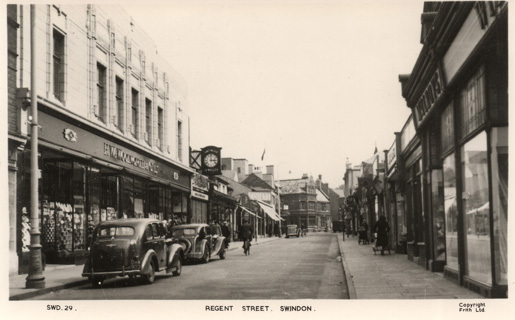 It seems Swindon was the true trial store for the chain. Here is the store in 2006. 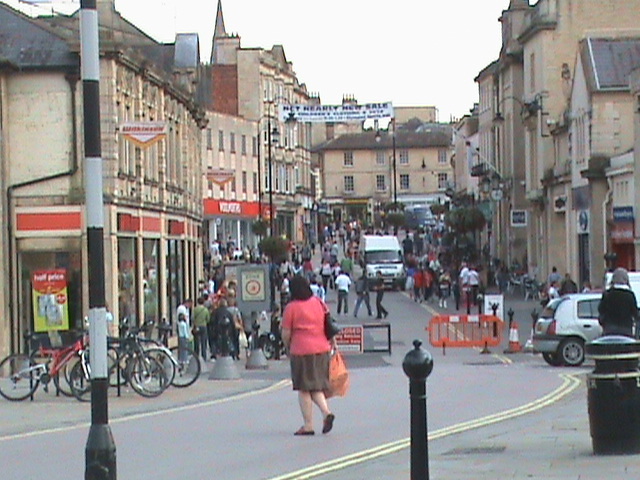 This is the image many head office folk will remember as we were sent on training courses in Swindon. It truly was enormous inside. 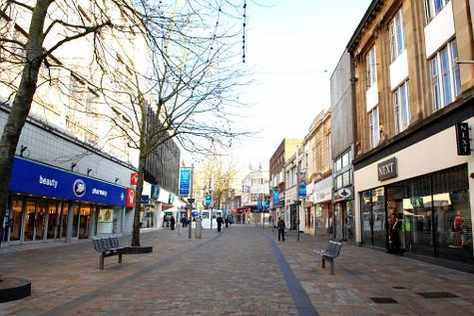 The store closed down in January 2009, and a year later it reopened as a temporary BHS, while their site was demolished as part of the £25m ‘The Parade‘ redevelopment project that houses stores including BHS, Topshop and River Island. This is now complete. 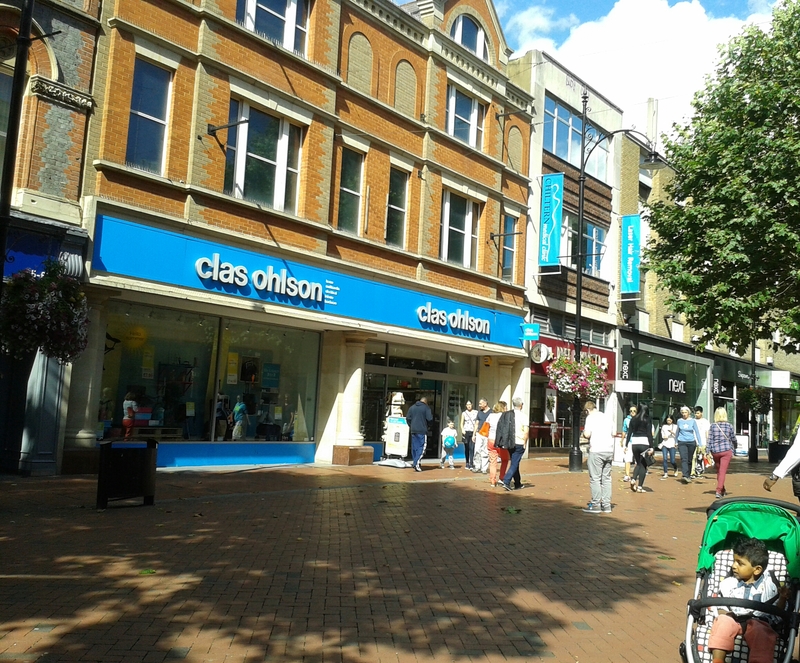 Today the unit has been spilt and is occupied by the oh-so-glam Poundworld, DiscountUK and Peacocks. Priceless next door seems to have disappeared too. 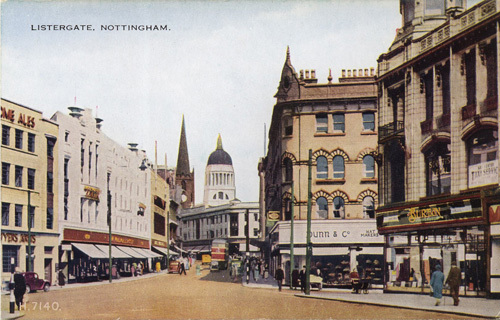 Over 100 years ago in August 1914, Woolworths opened their first Nottingham store in historic Listergate. 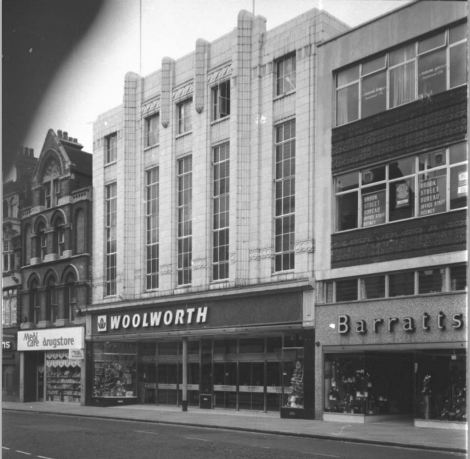 It possibly started off small, as between 1936-1937 F.W.Woolworth architects designed the most large-scale Art Deco front, extending the store to 22-26 Listergate. You can see how large it was in the below 1950s postcard. 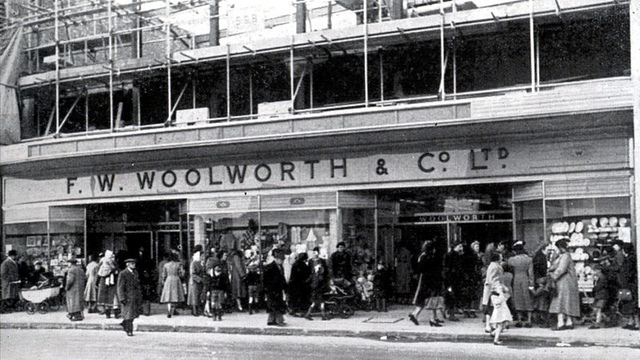 In the 1960s, Woolworths extended into 34-38 Listergate, so there was a link from 22-26 on the ground floor through to 34-38. It was one giant store split in two. There was an enormous cafeteria that would seat approximately 500 people – some say the cafe was larger than some shops on the high street! Here is what the new half looked like. 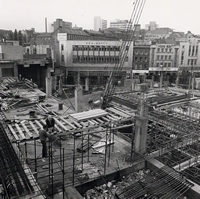 1972 was when the Broadmarsh Shopping Centre was being built. 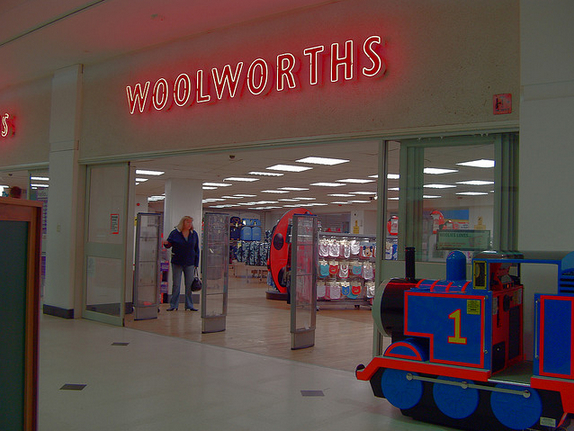 Below is a photo showing this, and you can see the two halves of the Woolworths in the background. 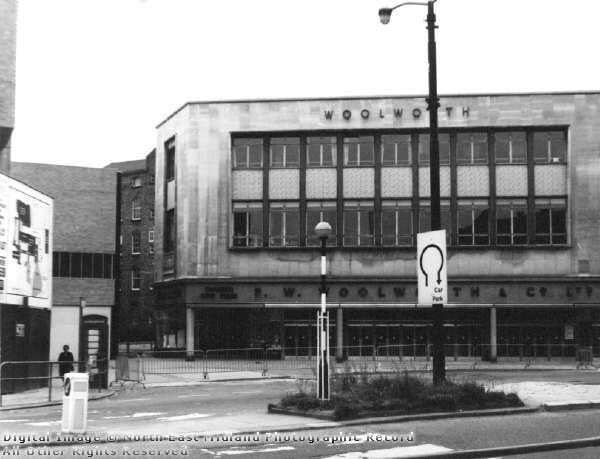 In the mid-70s, the fascias were updated to the new red ‘Woolworth’ and logo. In 1984 Kingfisher sold the store, as they were getting rid of large stores to get more capital. 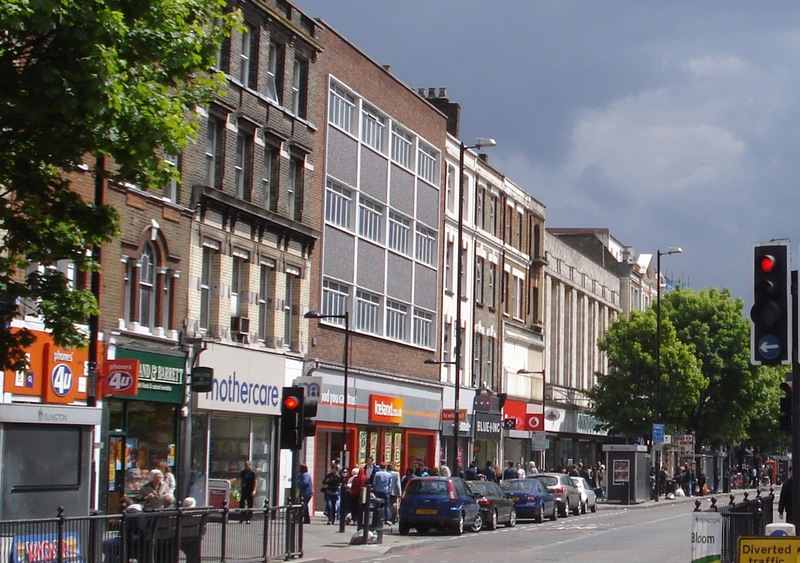 The Listergate stores were sold to Boots. 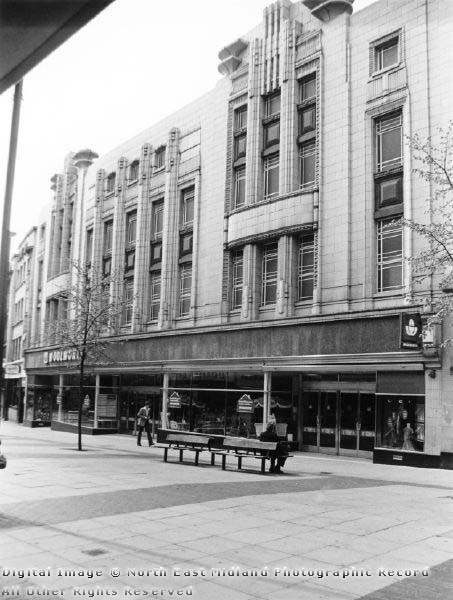 By this time there were many other Woolworths branches scattered across Nottingham, and they reopened in the town centre in 1991 in the new Victoria Centre. 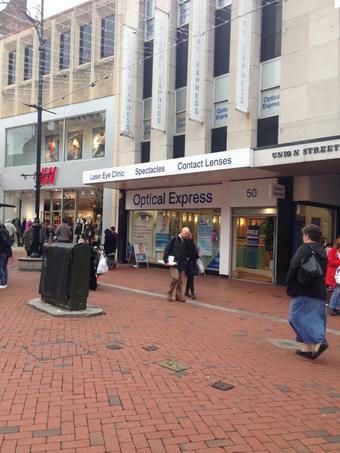 Today, 22-26 Listergate is occupied by M&S, and 34-38 Listergate is occupied by Poundland, Optical Express and WHSmith. 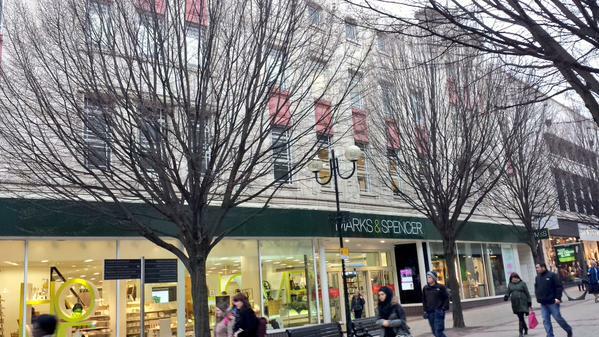 Here they are, both buildings looking remarkably as they did in their heyday, with the Art Deco front still looking as elegant and grand on the M&S store. 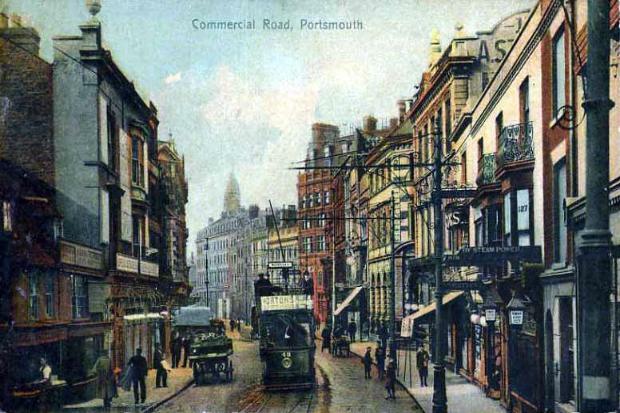 100 years ago, on 22nd August 1914, Woolworths opened in the naval city of Portsmouth on Commercial Road, a year before the neighbouring Southsea branch opened. 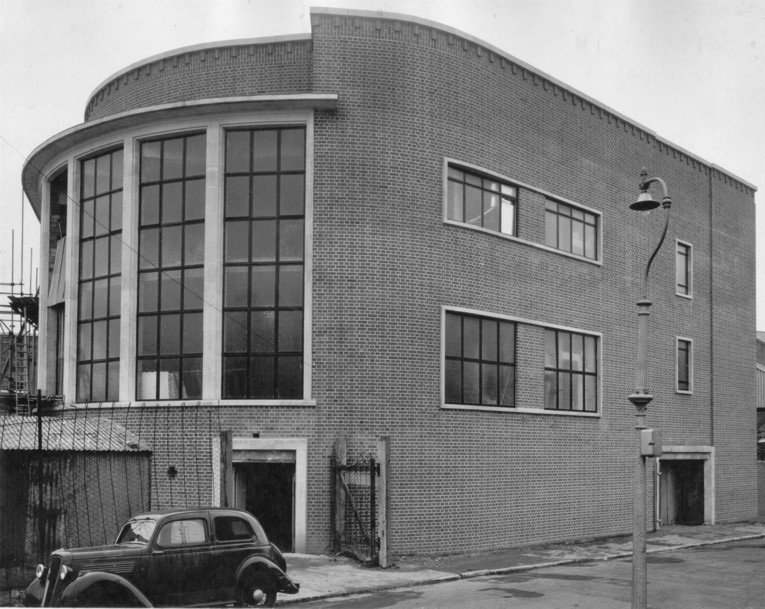 The premises started off small, but had a series of extensions in 1926, 1934 and 1938. 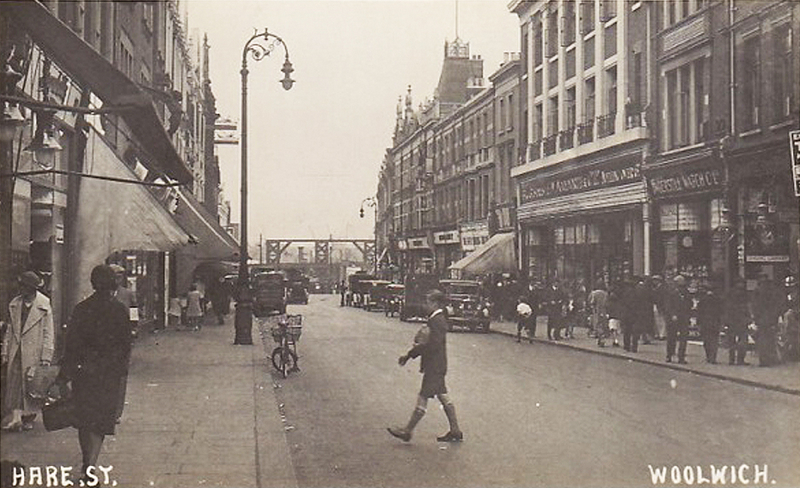 Below is a postcard of Commercial Road in the 1920s, so you can imagine somewhere along this street stood the Woolworths. With the city being a major naval port, it suffered terribly during WW2, and the Woolworths building was one of the casualties, being totally destroyed on 11th January 1941. 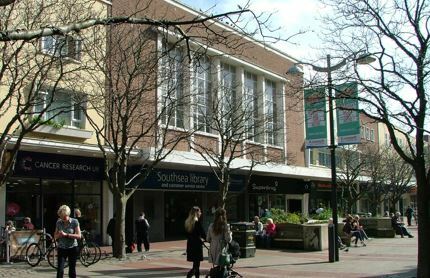 The staff were moved to the nearby Fratton store. A huge superstore was built in its place, reopening in stages from 1950 to 1953. Below is a photo that may possibly be one of the opening days from all the crowds outside. The size of the shop may have looked normal from the front, but from this birds eye view, you can see the scale of the store – massive. The back of the store had a lovely curved feature with huge long windows. This was where the restaurant stood, on a mezzanine floor, with a spiral staircase by the windows leading up to the seating area. The restaurant had light flooding in from the windows, and there was rarely a seat free with it being so popular with customers. 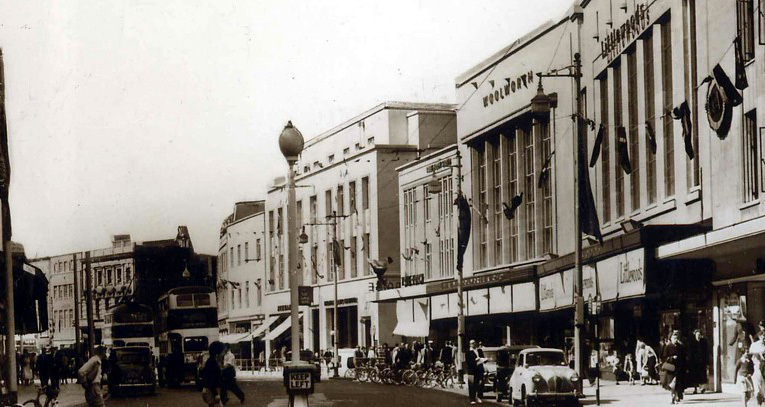 Here is a photo of the finished store in the late 1950s, with Littlewoods next door in a similar styled building. 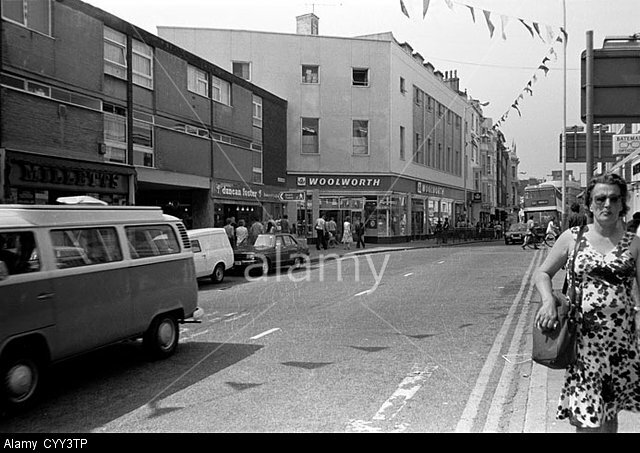 Below is a 1970s photo of Commercial Road from ‘A Tale of One City’, with Woolworths on the far left. 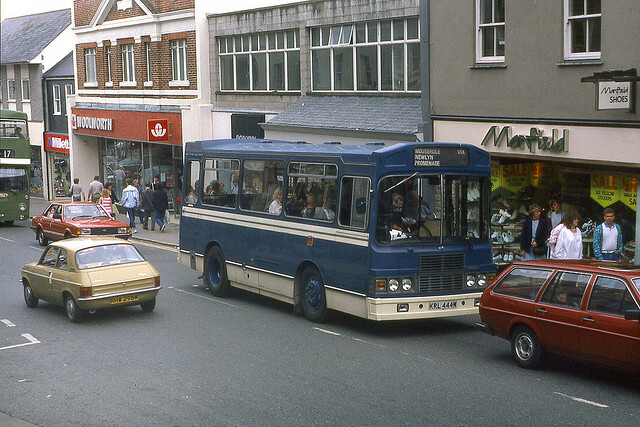 This was shortly before the road was pedestrianised. 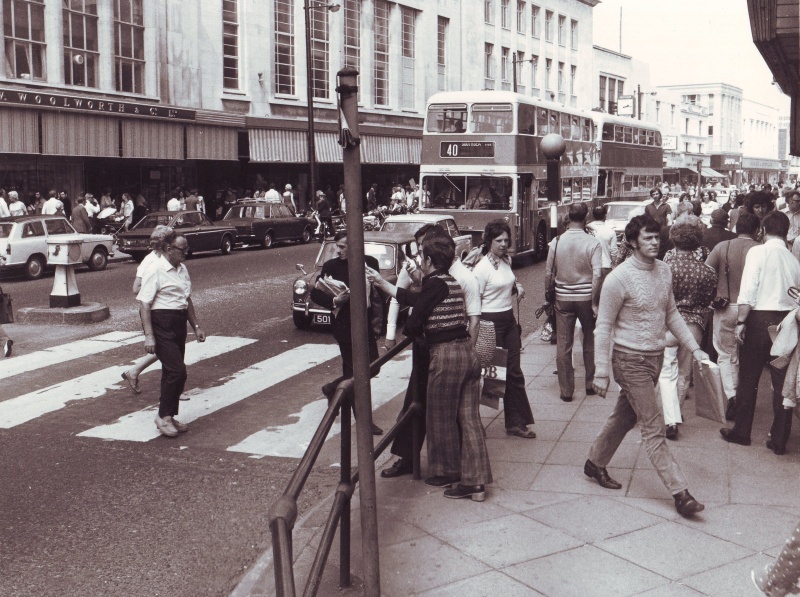 After the road was pedestrianised, Woolworths also had a 70s makeover, and below is a photo showing the new fascia. 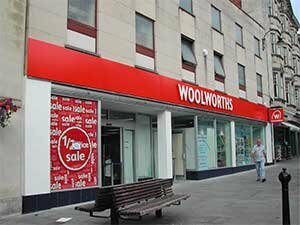 Here is a photo from 2004, showing Woolworths really standing out with their signage. Littlewoods Extra is next door, but they closed down the year after and Primark took over that space. 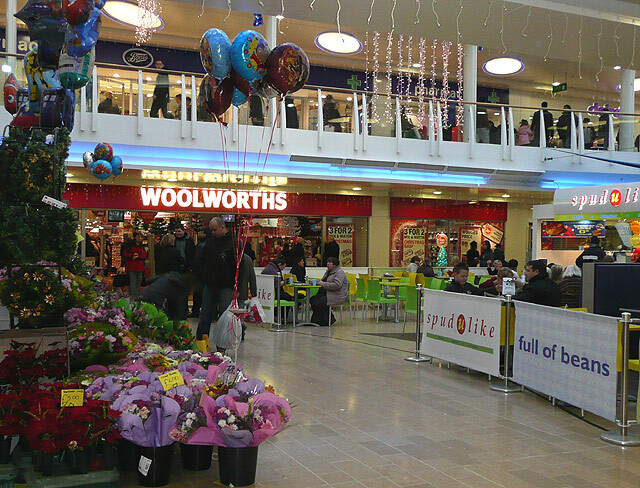 Below are two photos from 2008 before Woolworths closed down, one from the High Street and the other from the Cascades shopping centre entrance. Portsmouth Woolworths closed on 27th December 2008. The shop lay empty for 2 and a half years, possibly as it was such a large space. 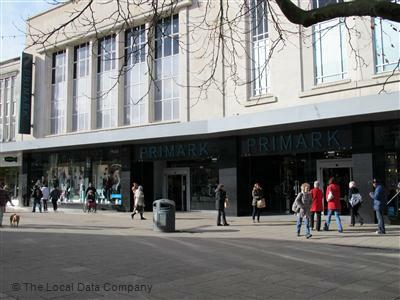 Then in 2011, neighbouring Primark announced they were planning to extend into the 30,000 sq ft space, creating one giant super-Primark. 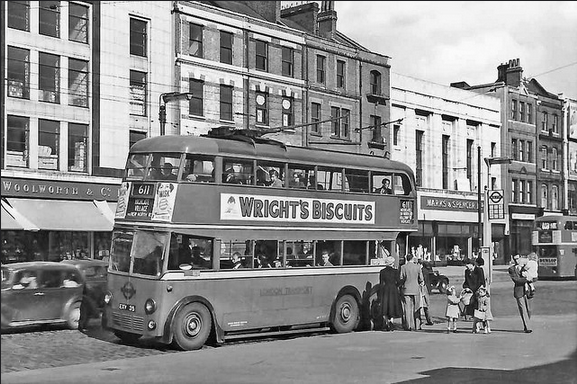 Below are a series of photos of the Woolwich store through the decades. 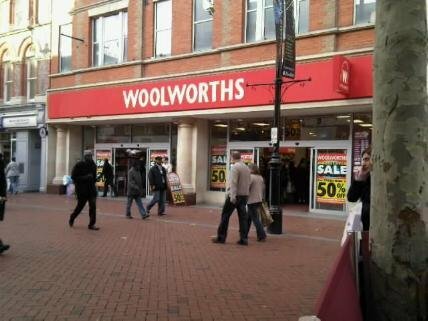 In the 1980s, the new Woolworths management decided on a drastic disposal of stores to cut costs, and sadly Woolwich was one of the ones to go. It closed down on 26th April 1986. 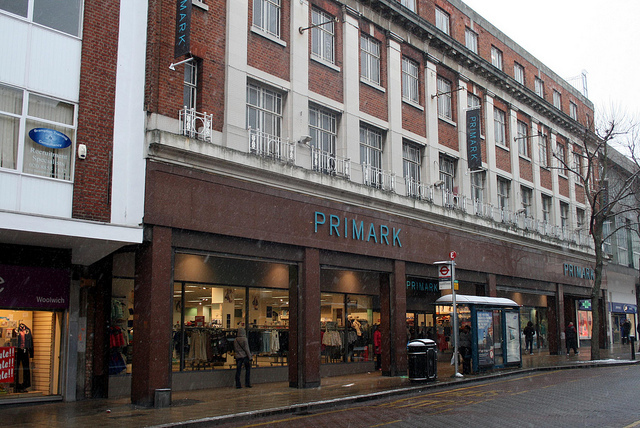 Today the building is occupied by Primark. Boots is still next door, and that BHS is now a Peacocks store. 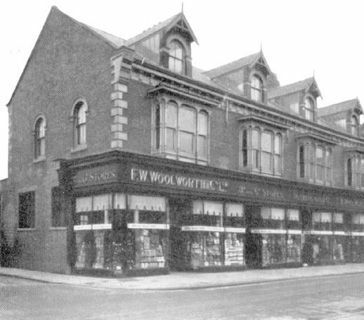 The eighth Woolworths branch to open in the UK was at Middlesbrough, back in 1911. 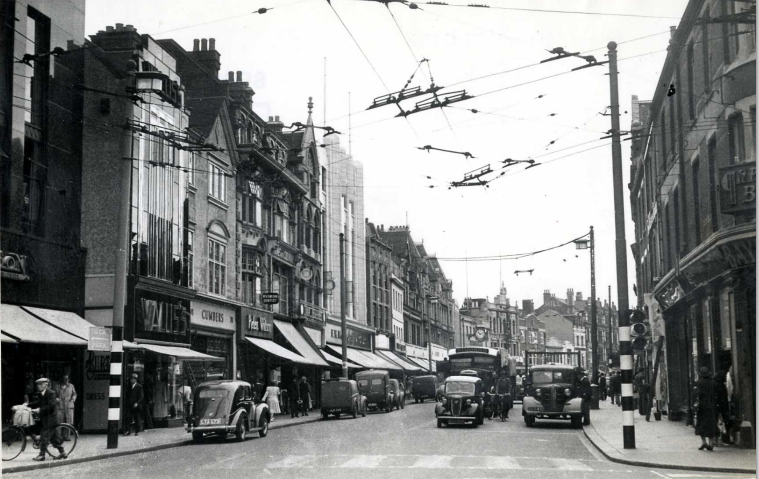 According to the 1913 Kelly’s Directory of North and East Ridings of Yorkshire, it originally opened at 91-93 Linthorpe Road, but then moved to bigger premises at 51 -67 in 1926 (pictured below). Middlesbrough was bombed quite severely in WWII and Woolworths was hit. The store was rebuilt throughout the 1950s, reopening with a more modern look in 1959. 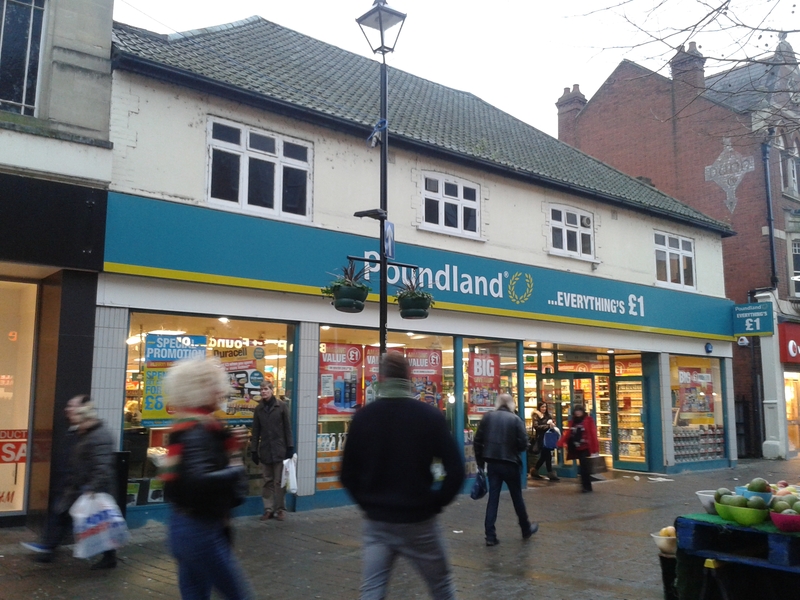 It traded for another 20 years before closing down in the 1980s when Kingfisher took over. The building was split into 3 units and occupied by Currys, Champion and Fosters in the 1980s. 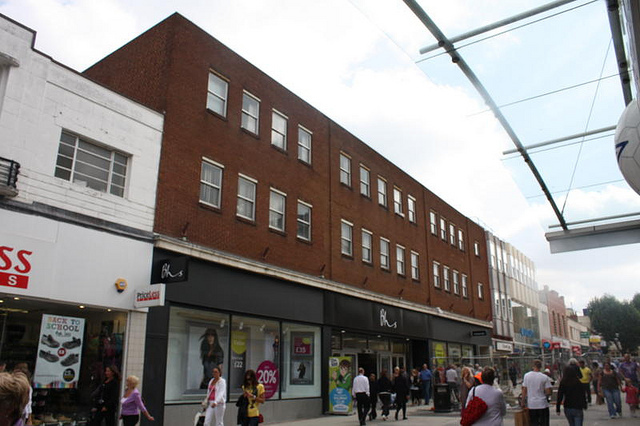 Today the building is now occupied by USC and River Island – the closed down unit was Currys.digital until recently. You can see from the below photo how imposing a building it was. It would have been quite a large Woolworths store. 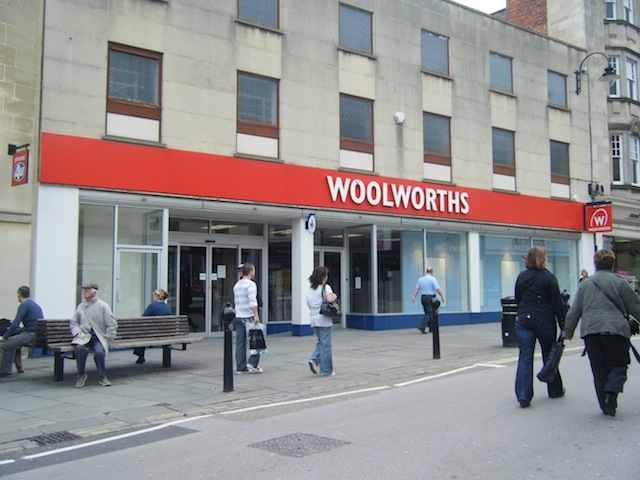 In the 2000s, Woolworths returned to Middlesbrough as store 1200, which I’ll cover in a separate post. 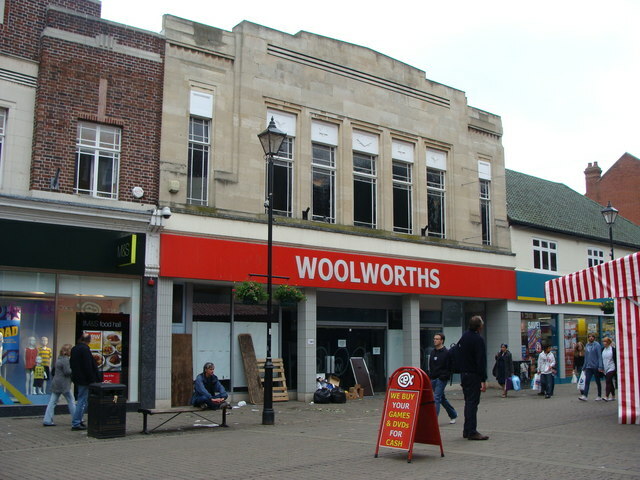 Woolworths opened on the High Street in Crawley on 26th July 1940. It was the last store in the chain to open for another 6 years, due to World War 2. Below you can see it’s the building with the awning and a car parked in front of it. The Woolworth architects had designed an upper balcony and a small turret on the roof. This store closed in 1957 when they moved to the ‘new town’. 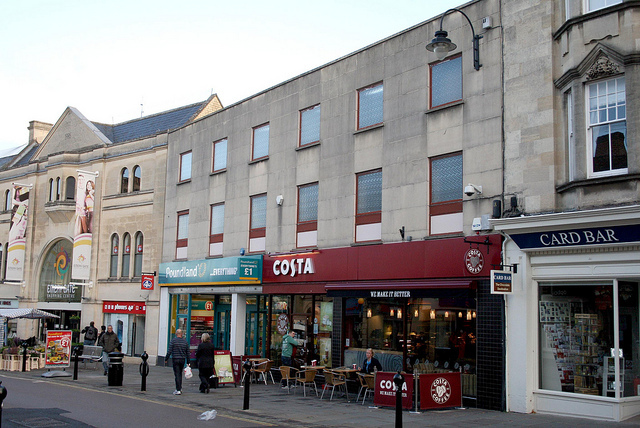 The building was subsequently occupied by a Halifax branch, and today it is a Wetherspoons pub – The Jubilee Oak. The building has not changed at all. 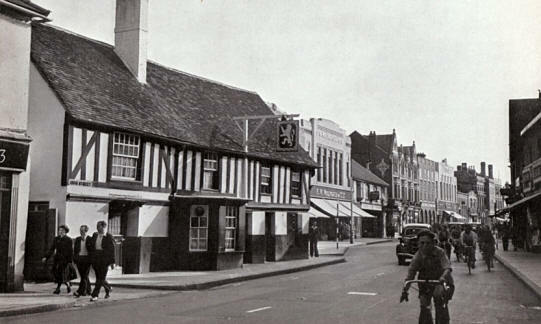 In the 1950s, Crawley was designated as a ‘new town’ by the government due to it’s rapidly expanding population. 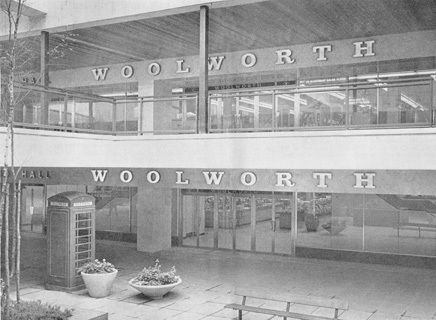 Woolworths moved from it’s small High St store to Queens Square where it opened as the largest self-service store of the 1950s. Now here’s something random. 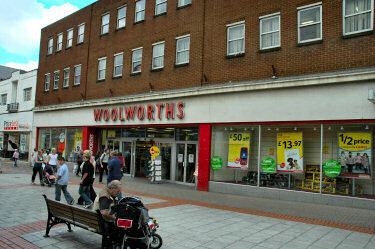 You can buy a 252 piece jigsaw puzzle of the Crawley Woolworths 1950s store front from Amazon here. Shipped from America. Weird! 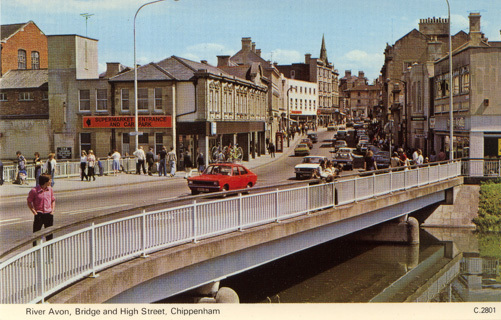 Here you can see it in 1971, looking a bit shabby after 14 years. Another random fact, Chico did an instore signing of his single D.I.S.C.O in Crawley Woolworths in August 2006. Here is the store in 2008, before it closed later that year. 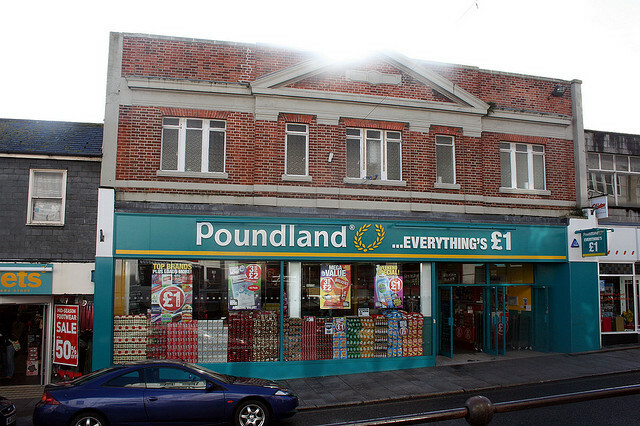 Today the building is occupied by Poundland. 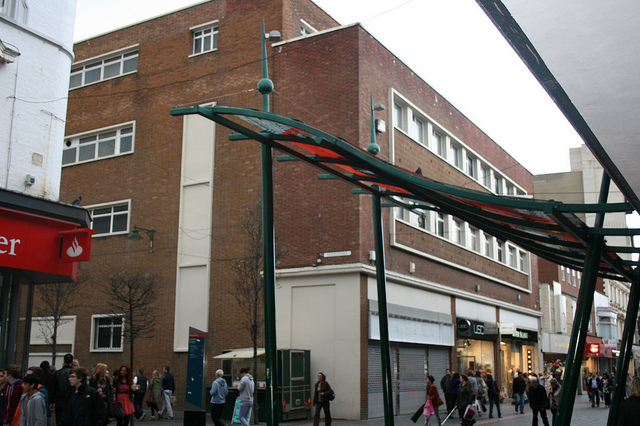 It was planned to demolish the building in 2013 as part of the Queens Square regeneration, but it is staying put and the actual square is being renovated now. 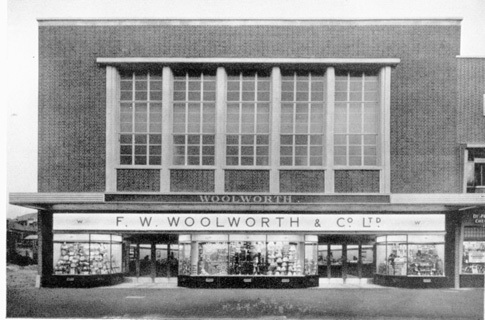 Woolworths opened in West Wickham High Street in 1935. 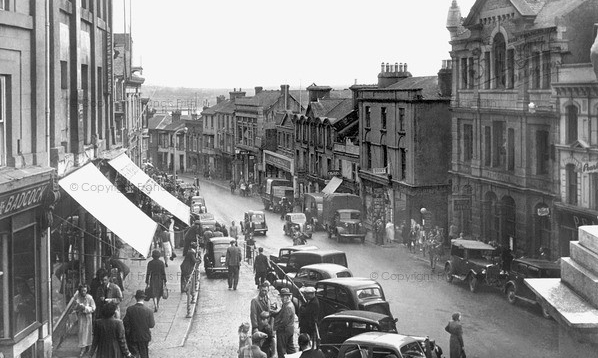 You can see it in the centre of this 1950s photo. They traded from this site without much change to the exterior at all. This was one of the stores that had the doors to one side rather than in the centre. It closed on 30th December 2008. 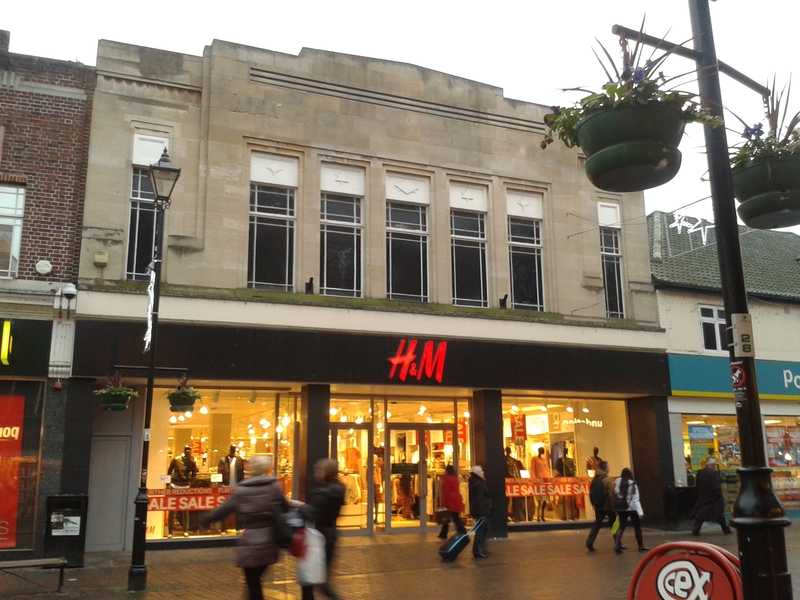 Shortly after it’s closure, a Carpetright opened here, where it still trades today. 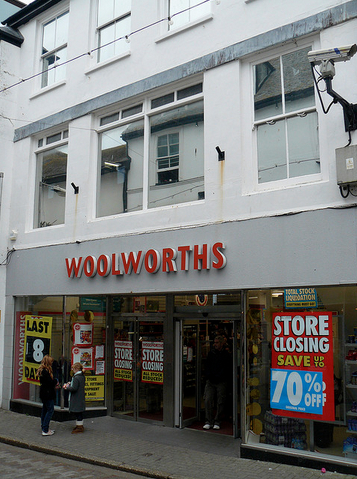 There once was a Woolworths store at St Leonards-on-Sea, down the road from Hastings. 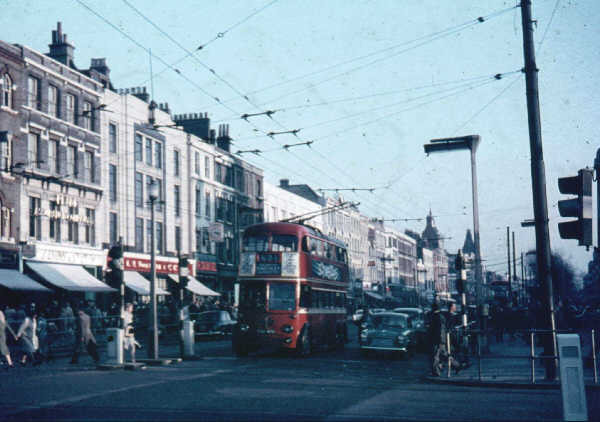 It opened in the 1950s on Kings Road, quite close to St Leonards Warrior Square train station. 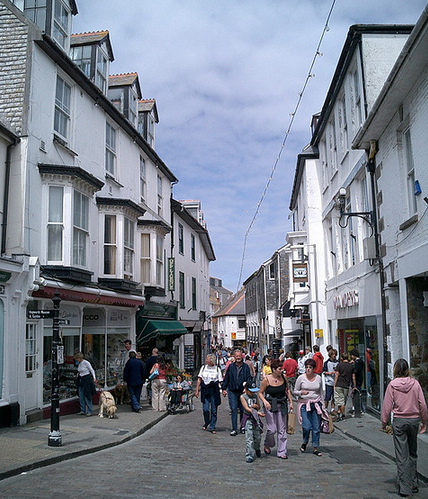 It is on the right of the below photo – the building with the narrow arched windows. I don’t know when it closed, but it wasn’t on the 2008 store list. 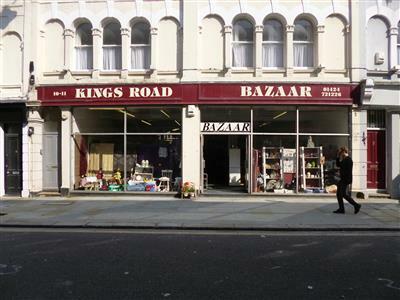 Today the building is occupied by Kings Road Bazaar – quite appropriate as you could say Woolworths was sort of a bazaar of its own. 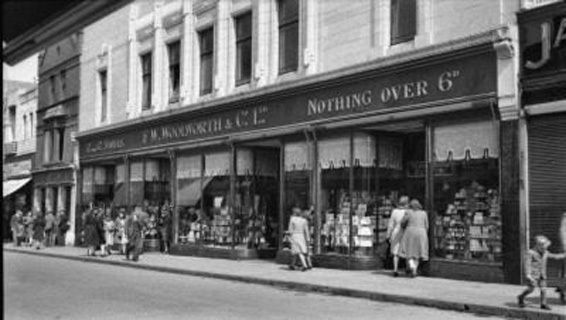 Woolworths came to Penzance in April 1936, opening on Market Jew Street. The store was extended in 1938. 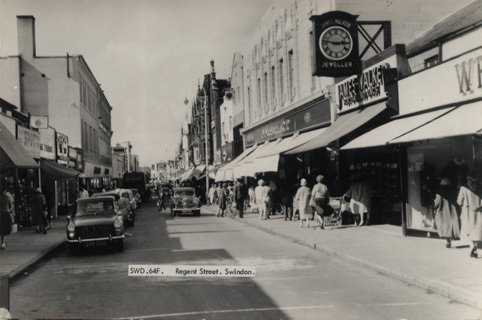 Below is a 1955 photo – Woolworths in the centre on the right hand side, with the triangle feature on the roof. 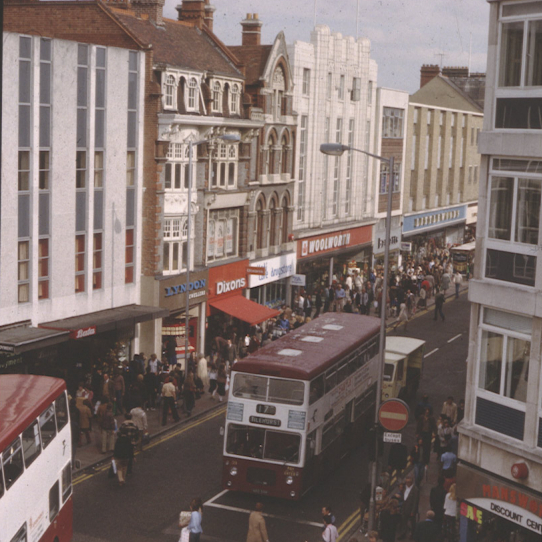 In 1972, the store was modernised, refurbished and converted to self-service, and then in 1986 there was an upgrade to the Comparison Store format. There was a further refurb in 1993. Below is a photo in 2007, a year before they closed down. They closed for good on 27th December 2008. Here is when the letters were took off just before the annual Mazey Day celebrations. 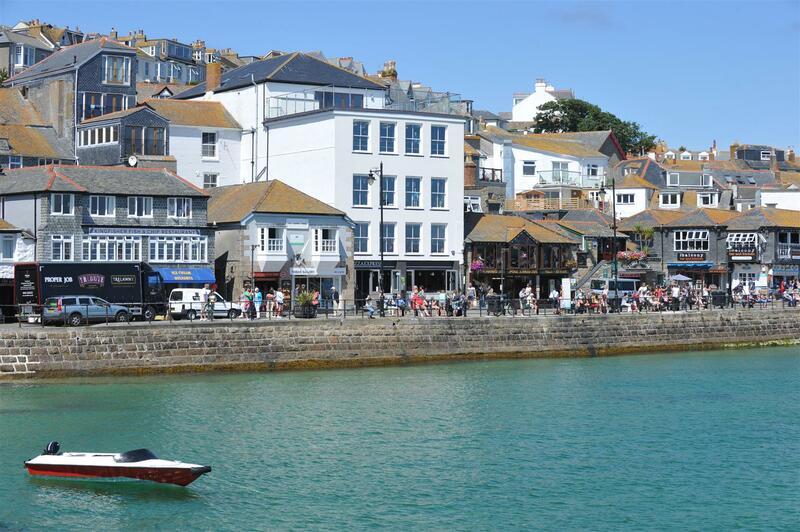 Woolworths arrived in the Cornish seaside town of St Ives in the mid-1950s. 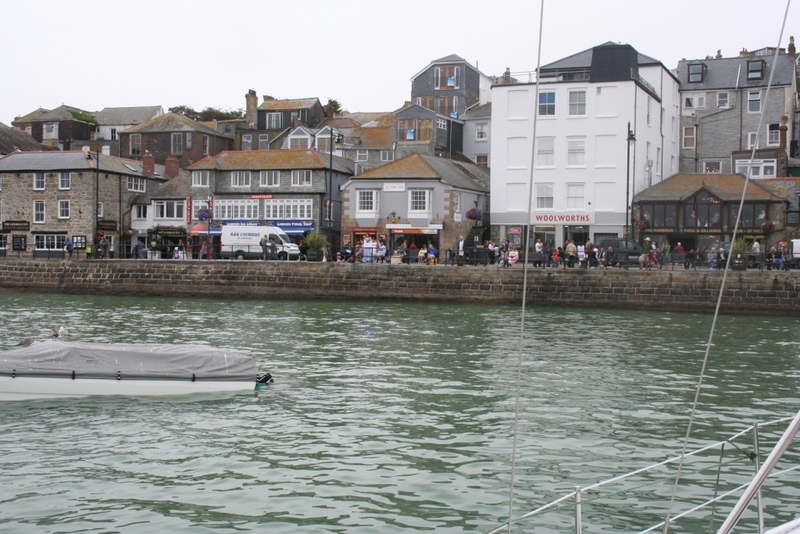 The building they chose was set in a hill by the harbour, with the front facing the busy shopping area of Fore Street, and the back facing the harbour on Wharf Road. 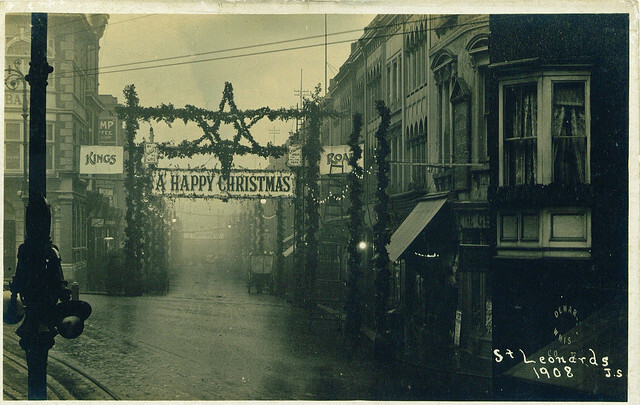 Here is the front of the store on Fore Street. And this is the harbour side on Wharf Road. This is 8 days before they closed down. 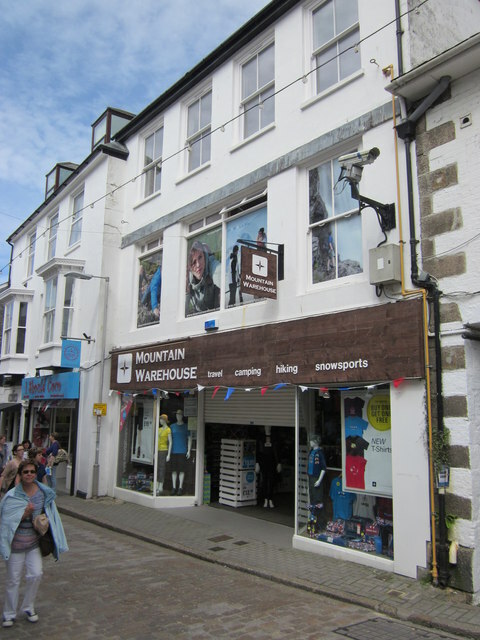 The store closed on 2nd January 2009, becoming a Mountain Warehouse store on Fore Street, and a Pizza Express on Wharf Road.